I was going through the typical stages of grieving. I like writing, so I started jotting down all my feelings, and let my emotions flow on paper. It was like opening a floodgate of emotions - all my negative thoughts and feelings came pouring out. After doing this continuously for a few weeks, I was able to move toward the stage of acceptance. 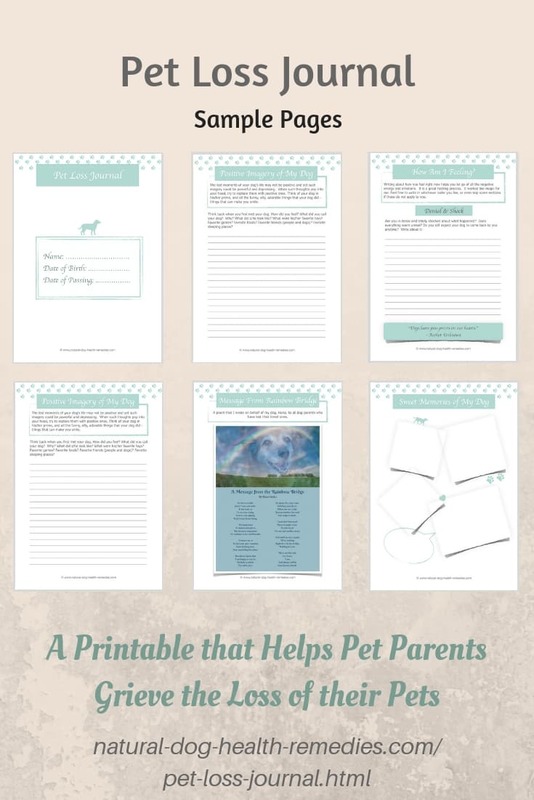 Using my experience and further research on grief management, I have made this Pet Loss Journal, which is a printable PDF file, to help other pet parents who are going through the same heart-wrenching experience cope with the situation. The Pet Loss Journal has 24 pages, and it guides you through different stages of grief by asking you questions and inviting you to write down your feelings. It then leads you to think more positive thoughts about your pet - what s/he was like, fun things that you did together, how your pet helped you, what you have learned from your pet, etc. You will also be invited to write a goodbye letter to your pet for closure, and do different things to memorialize your pet. There are blank pages for photos and drawings. Also included in the Journal are quotes on grieving, as well as a poem that I wrote on behalf of my dog Hana to all dog parents who have lost their beloved fur-babies, called "A Message from the Rainbow Bridge". As you work through the Journal, hopefully your feelings will gradually move toward the stage of acceptance and onto the road of healing. After downloading the printable (a PDF file) onto your computer, print it out, and I suggest that you put the pages in a 3-ring binder. The pages are not numbered - you can add extra pages to any section if you have a lot more to write about (there is a blank page at the end of the file for that purpose). I sincerely hope that this Pet Loss Journal can help you through this very difficult time in your life. Be strong. Have faith. You will feel better.